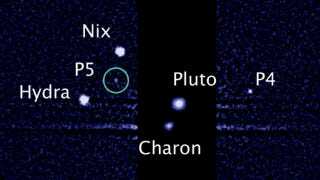 Have Trekkies taken over the voting on the naming of Pluto's new moons? Last week we reported on a SETI initiative allowing the public to vote on their favorite names for Pluto's 4th and 5th moons. The voting is scheduled to close on February 25th, after which time the top names will be presented to the International Astronomical Union (IAU) for consideration. Initially, SETI provided a short list of Greek and Roman themed names, but voters were encouraged to propose their own. Now, as Universe Today reports, William Shatner has stirred the mix by proposing 'Vulcan' — a name that's now leading the charge. This astronomical horse-race has the propensity to get interesting. In order to be considered, the IAU's naming convention simply states "Those that share Pluto's orbital rhythm take the name of underworld deities," And the named moons of Charon, Nix & Hydra all follow this convention. Shatner's case for Vulcan does cite the god as "The nephew of Pluto" in Roman mythology, but anyone who had studied Roman and Greek mythos knows that familial relations can be proven between nearly any given god and/or goddess. Interestingly, [researcher and co-discoverer Mark] Showalter turned down Shatner's second Star Trek/mythological suggestion of Romulus, citing that Romulus and Remus are already the names of the moons of asteroid 87 Silvia. While the "double naming" of objects in the solar system isn't unheard of, it may be a definite strike against a proposal. Cerberus, Orpheus, Hypnos & Persephone are all names in the running that are all also assigned to asteroids. There's more at Universe Today, including precedents for 'Vulcan' as a name for celestial bodies.